I've been exposed to a lot of business authors and their work, and I have to say you must be a very busy man. The sheer number of organizations you used as examples is just extraordinary. RS: I'm not that busy. It's an act. We [Sutton and Huggy Rao] just do the best that we can. Cursed with having between us about 50 years of academic background. And we have tenure. So we just keep going and going, not necessarily a good thing. It was quite an adventure. The last time we talked to you as a Cool Friend was way back in 2002, if you can believe it. Then in 2006 we talked to your coauthor, Jeff Pfeffer, about Hard Facts, Dangerous Half-Truths, and Total Nonsense. Today we're going to talk about Scaling Up Excellence. Obviously we have a great affection for your title because we kind of like excellence over here. Tell us what you and Huggy Rao were trying to accomplish by writing this. RS: It was a series of accidents that led to the book. The first was that we started doing stuff at the Stanford d.school when it was brand new and we were struggling with various issues around teaching design thinking. Very early on, a bunch of executives came up to us and essentially said, "This is nice. We have innovation in some pockets of the organization. How do we spread it?" That got our gears going. Around the same time, Huggy had done a case study of something called The Hundred Thousand Lives Campaign, which was an attempt to spread evidence-based practices in American hospitals to reduce preventable deaths. We got the scaling thing in our mind, and we started doing some case studies and talking to people. We figured out that whether we talked to startups or big companies or people in education, whenever we would use the word "scaling" they'd get all excited, even though none of us completely agreed what it was. That was the confluence of events, but a lot of it was just that Huggy and I had these really lousy answers to the questions that everybody would ask us. So we spent seven years trying to develop a point of view, which I think we have done. I love the idea of needing to write a book in order to find better answers to questions. RS: As Huggy says, sometimes it feels like more of a learning adventure than the writing of a book. The book is just a representation of the work, which does continue. We're teaching classes on scaling. Huggy is going to teach one next year with the CEO of Adobe. And I'm going to do one with some startups that are near or were started at Stanford, to help them with scaling issues. We continue to talk with companies about our ideas, we continue to develop our ideas. I think the way that people can really look at scaling in a very simplified way is how you conceptualize the "Problem of More." RS: Yeah. I think that's what the whole book is about. You've got something good, you want more of it. How do you do that? I think that's almost the whole book, even though we wrote all that other text. Right. The remarkable thing about this book is the breadth of the population who can use it. 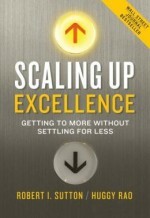 Even though it's very much a business book in that it has "scaling" in its title, this can be used for any organization. When I was reading the book, I immediately thought of a nonprofit. RS: Scaling is a big issue for nonprofits. I hope you saw we mentioned the Girl Scouts in the book. My wife is CEO of the Girl Scouts of Northern California. If they don't sell those cookies, she has to lay off people. Yeah, everybody's got certain capitalist pressures. There's lots and lots of academic research on scaling. On things like spreading anti-poverty programs in Africa; that's a big issue. It really is. Could you explain the two scaling methods that you focus on in the book, the Catholic and the Buddhist? RS: Sure. First of all, let me give a proviso since every now and then we seem to upset someone, which isn't always bad. But occasionally a Buddhist or a Catholic will write us a nasty note and say, "We don't understand." We are not using the terms literally; it's an analogy. It could be scaling up the number of employees. It could be moving to a different market, say from the U.S. to China. Or you're rolling out an IT program across an organization. It's the question of whether we insist that everybody do the exact same thing in the exact same way, the Catholic method, or do we allow local variation and give them the power to do those local variations, the Buddhist method. That was an issue that came up constantly. Just yesterday I spent all day with Finns, who are not the most expressive people on earth. But once they started talking about using Buddhist vs. Catholic methods of scaling, it turned out to be a huge thing in their industry. The guy from the local FAA, essentially the Finnish FAA, has to consider the question of whether you apply the exact same standards to every sort of plane, every sort of pilot, every country. It's something they talk about every day at work. It's the question of knowing when to lean towards and insist on standardization or allow more local autonomy and local customization. It certainly is a broad strategic issue. We use an example of when IKEA went into China. They did lots of local customization. But it's also something that happens every day on the ground. A lot of times managers will say, "Well, how do I handle exceptions?" That's always a big issue. You mentioned IKEA in the book and how differently they handled things in China than Home Depot did. RS: Both of them show how you have to change in a new market. Home Depot didn't and they failed, because they didn't understand the do-it-for-me culture in China. IKEA did, and they succeeded. They offered paid services to build the furniture instead of leaving it to the buyer to build. When you look at what happens when people spread large, successful, visible organizations, sometimes in the process they actually change the setting that they're coming into. So that's another thing that we're really struggling with in regards the Buddhism method. The question sometimes boils down to this: To what degree are you customizing what you do to fit the local culture (a more Buddhist approach)? This could be an organizational culture. It could be a country culture. Versus: To what extent are you changing people and practices so that they become more like what you already have and fit your organization better (a more Catholic approach)? Four or five months ago I had a conversation with a group of 50 CEOs of small to mid-sized companies from China. I presented the story of IKEA. They said, "Well, that's right. We probably do use more assembly and delivery services than any other IKEA customers in the world." Then they said, "But IKEA is training us, and we now often assemble that stuff ourselves." But they said, "Only IKEA." So IKEA has trained them. In the process you can come and adapt to the local culture. But then you can train them to become a bit more like you want them to be. It's sort of fascinating. It is. Home Depot goes in and says, "We're do-it-yourself," and the Chinese say, "That's great, but we're not." They don't succeed, and they actually end up leaving. Then IKEA comes in and says, "We're do-it-yourself, but we will do it for you for a price." Yet they end up spreading their own style. RS: Yeah, they spread their own style. There are also other sorts of constraints that I think are quite interesting in the international arena. Like when you roll out an IT system—we talked about this a lot with Kaiser Permanente—the extent that you require each region to do the exact same thing in the same way versus allowing local autonomy. That was a big issue for one of our scaling heroes, Louise Liang. Huggy found another example that's cultural. Illy Coffee started its coffee stands in Italy. In Italy they walk up, they take the shot of espresso, and they leave. The stores only need a really small footprint. But then when they started opening up stores in India, where Huggy is from, they realized that that's not how it works culturally. In India, to be successful, they needed larger stores with chairs and places to sit. Those things are interesting to me—those little cultural adjustments you have to make. Those are the cultural constraints. But there are also "crucial constraints" or "guardrails" that you mention in the book that are so important to scaling if you're going to allow autonomy. RS: That means you have to understand exactly what you're spreading in the cultural context. That's why our scaling hero, Louise Liang, was successful. She understood Kaiser in sort of a mass of details, having been everything from a physician to an administrator. She had the contextual knowledge of what few things would actually matter. She knew where the constraints would be most effective. There's another example from NBBJ, a really fancy, high-end architecture company. They did the Gates Foundation building. It's funny that the managing partner, used the word "guardrails"—just off the top of his head—when describing using constraints. I had heard Louise Liang use it almost a year before. He talked about how they had to use certain constraints so that all their individual offices didn't confuse clients and they had some cultural control of the organization. One of my favorite ones was that every office seemed to be using different branding, different logos. So he put up some guardrails, if you will. That was a case where they just needed a little bit of top-down control, but not too much. Right. Especially when you have that number of creatives, you want them to be able to really flourish like at IDEO or places like that. But at the same time you have to have something that unifies everyone. RS: Yeah. It's interesting. I know IDEO very well because I've been hanging out with them now for close to 20 years. But NBBJ does something similar to what IDEO does. One of the most important things is the work that they don't take. When business is good this works, but the temptation is when business is bad. At IDEO they try to take only stuff that is challenging to the people who work there and also that reinforces their brand in the marketplace as a company that does creative, interesting, high-end products. So that's another kind of guardrail. Another important concept from the book is the pre-mortem. Basically, it's a method you undergo with your team that really eliminates people becoming "yes" people. Can you explain it? RS: The pre-mortem. 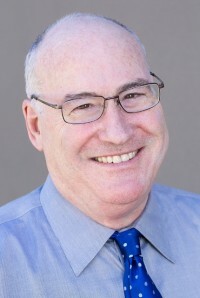 Probably the first time I read about it was in graduate school from the famous Karl Weick—Tom actually talked a lot about him in In Search of Excellence—he's one of those people who has had all sorts of influence. Weick hauled up this old research that showed that essentially, if you look back from the future and think about what would have happened and imagine whether you've succeeded or failed, there's something weird about it that makes it more vivid than simply asking yourself, "What is necessary for success? What's necessary for failure?" As Gary Klein says, "[The pre-mortem] makes it more acceptable, for some reason, to raise possible failures, because you haven't failed yet." It's strange, but if you do that weird mind trick, there's quite good evidence that people tend to make better decisions. It especially allows you to think about failures in more detail. Huggy and I now do that with all sorts of groups. We've done it with the fundraising group at Stanford, a large automobile company that really needed it, a clothing manufacturer, and a sales organization. If you do it in a simple way, people are pretty good about being able to dig in and describe, "Now we've succeeded, what happened?" Or, "Now we've failed." The most interesting ones, to me at least, are companies where this happened. We basically said to them, "Okay, now you failed and your once great brand is in tatters, what happened?" And they were able to describe in quite a bit of detail how they sold so much different stuff that nobody could figure out what they meant to customers. And also they were willing to put their brand on virtually everything. So it got watered down. Then they said, "Oh, this is actually a bunch of things we're doing already. Maybe we should rethink them." Right. The part that's fascinating to me is that when people are looking forward, there's all that hope and positivity. Nobody wants to burst the bubble of the person with the idea. But if you look back, it almost creates that competition for who can come up with the worst case scenario or the most creative obstacle in the way. RS: You just said something really important, which is that when a pre-mortem is done right, there becomes social pressure to talk about what went wrong, instead of social pressure to not say a discouraging word. And that's something that Dan Kahneman really emphasizes, that very often when you get together a group of managers, there's so much pressure for optimism and also for not criticizing the boss, that the smart bosses find some way to get around that and make it safe or even cool to talk about the problems that may occur. The last concept I want to touch on is, "I own the place. The place owns me." RS: It's almost like a propellant. Places where I've seen this are IDEO or McKinsey. I've never worked for McKinsey, but I've had them as an occasional client for about 12 years now, and I always joke that I've been working with them much longer than the tenure of the average employee, which is about two years. Even though people are there so briefly, there is such a sense at McKinsey that you not only have to do your job well, but you're under obligation to call out people when they're not doing it as well as they should, and to teach them how. And they're obligated to call you out. I've seen it at IDEO, and at General Electric, too, in many parts of the organization, that there's this notion that you maintain a certain standard. This is true of the best hospitals, by the way, the ones that catch and correct and learn from medical mistakes. Pixar is another place where that just runs through the culture. Because in a place like Pixar there's so much of a common acceptance—and this is really brought on by Ed Catmull's amazing leadership—that the main reason we're doing this is so that when our films come out, we are incredibly proud of them. Certainly there are financial incentives and some of the usual sort of stuff that you've seen in other organizations to create loyalty. But in terms of what drives the soul of that organization, it's ownership. I have to do the best possible job I can. I have to give other people help and criticism. And they are obligated to give it to me. The downside of places like that, by the way, is they're quite exhausting to work at. Everybody can tell you what to do. And you're always responsible for telling them what to do. Frankly, it's not my kind of place. I just want to be left alone. [Laughter] But that's what a great organization looks like. It's been an absolute pleasure talking to you today, Bob. Thank you so much.